Idaho Digital Learning Blog posts on all things professional development. Idaho Digital Learning has worked hard to create college and career pathways for students by leveraging new and existing partnerships with colleges, universities, and career-technical programs. Middle school and high school courses focused on college and career readiness are also offered to students throughout the state to help them identify and prepare for the next step of their journey. Preparation for college and career begins at an early age! Idaho Digital Learning currently provides courses such as Keyboarding, Pathways to Success, and Intro to STEM Careers to Middle School students. The focus of these courses is to help equip students with tools and skills they will need to be successful along their academic journey, as well as along their journey toward college or career. Over the past school year, Idaho Digital Learning has also partnered with one school district to begin offering this content to Elementary students. We are excited about the possibility of being able to extend this content into the Elementary grade level in years to come! High School students need preparation and guidance for college and career, as well. High School students enrolled through Idaho Digital Learning will find age appropriate versions of Keyboarding and Pathways to Success. Students in need of college and career focused content should also be encouraged to look into opportunities such as Dual Credit High School to College Transitions, Dual Credit Career and Life Planning, and Dual Credit Digital Literacy and Research Skills. Students looking to get a head start on their post-secondary degree can take advantage of the iPath program. This program allows students to complete a scope and sequence of courses targeted to a specific college or university program of study. The goal of this program is to provide students course offerings that are intentionally aligned to a program of study, that their courses will transfer cleanly to the post-secondary level, and that they may make a smooth transition into that program after high school. Highly motivated students will find General Education Matriculation (GEM) courses that would provide them the opportunity to earn up to an Associate’s Degree by the end of their high school career. Idaho Digital Learning is also proud to partner with Idaho Career-Technical Education to provide CTE Digital. The goal of CTE Digital is to provide all students equity of access to CTE programs. Web Development and Networking are two pathways currently available to students. We are continuing to build out program opportunities in other areas, as well, such as Business and Health. We also realize that all educators need to be equipped with the tools, skills, and knowledge to help students along their journey to successfully reach college and career opportunities. Idaho Digital Learning is the proud state affiliate for the Collaborative Counselor Training Initiative (CCTI) courses. This content is targeted to any educator looking to better support student college and career readiness within their district, school, or classroom. These are just some of the ways Idaho Digital Learning has been working to provide equity of access to college and career readiness to all students throughout the great state of Idaho. We are proud to partner with our public schools to provide these opportunities! Throughout our educational career we have become very familiar with the term, “Stop, Drop and Roll!” Why? Because it has been engrained in our minds since we were in kindergarten. This is an important skill, and even as adults, we remember and take this to heart. Nowadays, students need a different type of “Stop, Drop and Roll!” They need a playbook for digital literacy. The Internet is a big wide world, full of great learning; but, unfortunately there are also pitfalls that can arise. At an early age, students are beginning to develop as digital citizens and some might call them, digital natives. In today’s world, digital natives gain technical skills before entering kindergarten. They understand how to successfully retrieve and find information through digital means. We must question how to help students understand the validity and safety of using resources, websites, apps and social media. Web literacy leader, Alan November, explains how educational leaders should “craft a clear vision of connecting all students to the world’s learning resources” while modeling “the actions and behaviors that they wish to see in their schools.” For students, it’s not just about the validity of judgment, but it is also about replication of skills. Do our students know when to Google and when to use their own skill set? As school leaders we have the responsibility of ensuring that students are engaged in an effective learning environment — whether that environment is face-to-face or online. Digital Literacy is a critical component of any learning environment. Digital Literacy, as defined by The American Library Association’s Digital Literacy Task Force (2011), “the ability to use information and communication technologies to find, evaluate, create, and communicate information, requiring both cognitive and technical skills.” However, no matter the subject that is being taught it is important for students to know how to think critically and evaluate the digital world surrounding them. It is our job, as educators, to ensure that students are prepared for life in the real world, civically responsible and digitally literate. “Stop, Drop and Roll” should now be aligned with our connected world to safeguard our students ensuring that they are prepared for life, civically responsible, and digitally literate. The use of the 4 C’s is imperative for our students to emerge as literate digital citizens. It is critical that our students are learning for themselves today, but also to be productive citizens in the future. Critical Thinking will not only help our students grow with the world around them, but it will also help them understand when to “Stop” and reposition themselves now and in their future. Critical thinking will help them make adjustments while reviewing evidence, evaluating claims and learning the importance of rational decision making. Communication skills will teach our students how to be global citizens. Understanding the outlying factors in how to communicate well, will assist our students in the knowledge of when to “Drop” from uncomfortable situations. Creativity is now a driving skill for the workforce. Previously, creativity was thought of as a secondary skill; however now it arising as a critical driver. Sir Kenneth Robinson, stated, “Creativity is as important in education as literacy and we should treat it with the same status,” taken from http://www.nea.org/assets/docs/A-Guide-to-Four-Cs.pdf, page 23. Creativity is the skill that allows students to know when to “Roll”, move away from the source and analyze for validity. The 4 C’s are closely interwoven. Today all four skills are critical components for forward movement in school and life beyond. The ability to innovate rests on many different skillsets and the ability to interweave those skillsets together. Recognizing that we are all digital contributors means that educators are tasked with being intentional when providing opportunities for students to practice critical thinking, collaboration, communication, and creativity online. A Team Huddle could be a great strategy for implementing the 4 C’s into any learning environment. Gathering together with your team to listen, strategize and celebrate is common practice in sporting events. The “team huddle” involves a coach or a lead player that comes to the group with strategies for play, encouragement, and experience that serves to support the entire team. Players bring their questions, input and experiences, as well. Educators and families can use a “team huddle” to support learners in the area of digital literacy, while activating the “Stop, Drop and Roll” message for how to navigate and contribute online. Some students might feel reluctant to share negative online experiences for fear that these trusted adults will remove the Internet from them, entirely. Conversations about how digital footprints can be permanent can result in some students feeling regret and fear from their past online contributions. Explaining to learners that “from this moment on” they can choose to demonstrate positive digital citizenship and bring hope to this kind of situation. Looking for scenarios to work through with your team? Common Sense Education’s K-12 Digital Citizenship Curriculum offers educators, families and students guidelines, resources and connections with others around the globe that are working through many of the same digital dilemmas. When creating your team’s digital literacy playbook consider weaving in “The YOU MATTER Manifesto” from Angela Maiers. Your team’s playbook can include the familiarity of “Stop, Drop and Roll” while supporting students for online emergencies and encouraging productive and positive digital citizenship. As our students move along their educational path into the world beyond high school they will have a skillset that will enable them to be digital contributors in a thoughtful, meaningful, and safe way. Formalized instruction helps to guide students’ educational experiences and doing this with a global outlook, can be a challenge. This is hard to navigate alone, we are better together. IDLA is comprised of a group of educators that prides ourselves in working together and sharing strategies for the success and safety of all students. Idaho Digital Learning serves our students but also reaches out to all districts in Idaho to join their team huddle and be part of the collaboration for online and blended learning. In a world that is increasingly digital, passwords protect our valuable information and personal identity online. Every site from banking to social media requires a password for secure access. The problem is, each site has different criteria for an acceptable password. For example, most require both letters and numbers, are case sensitive and must have a certain amount of digits and/or numbers. Technology experts advise that you should never use the same password on multiple sites. With the growing number of accounts we each have, who can remember them all? As educational resources have begun to migrate into the digital format, students taking online classes are presented with this challenge daily. Not only do they have district assigned accounts, they have classes to access which have numerous resources that may require password protection. These added steps may become barriers that inhibit a student’s ability to learn efficiently and effectively. Feeling the need to remove this obstacle, Idaho Digital Learning has created digital learning portals. The custom school portals offer students the opportunity to access their online courses, resources, and more in a single easy-to-use location while allowing schools local control over their student’s online experience. Portals can also act as a communication tool, providing links to school internet acceptable use policies and tools that promote digital citizenship. Initially designed for districts and schools, the portal vision has since grown into other educational opportunities throughout Idaho. For example, Idaho Digital Learning has partnered with the Idaho State Department of Education to create the Educational Resource Library (ERL) which will provide professional development opportunities and resources to all Idaho teachers through the single sign-on portal environment. Due to the success of these portals, Idaho Digital Learning envisions the Parent Resource Center. A portal that provides one location where parents can access resources (learning tools, information, materials, and a vibrant community) available for them to support their child(ren) as they begin along their educational path and continue toward college and career opportunities. What started out as a solution for multiple passwords has grown into an awesome tool that provides efficiency thus making everybody’s lives simpler. 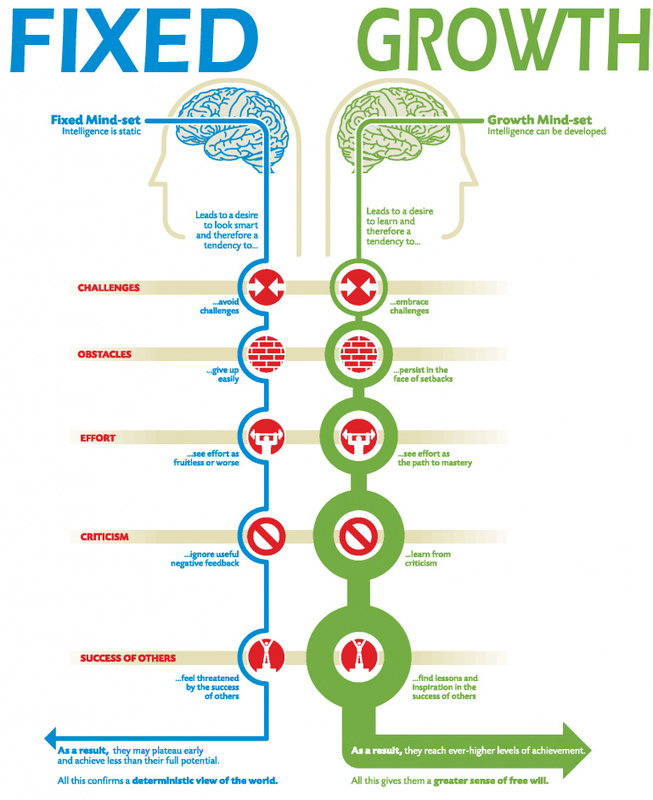 Are you of a fixed mindset or a growth mindset? Don’t know the difference? “Mindset” is a term you may hear a lot, lately. For a great read on this topic, check out Carol Dweck’s work, Mindset: The New Psychology of Success. Those with a fixed mindset believe their abilities and their environment are limiting. The only way to show value is to measure myself against others and find some way in which my individual success is greater than another, or to discolor the success of another to make myself look greater. For an individual with a fixed mindset, success is determined by their perceived value of the end product of their work. For a fixed mindset, the journey is less important than the destination. Those with a growth mindset believe their abilities are always evolving, and that their environment may change but cannot determine their success. An individual with a growth mindset may compare themselves to others, but not to determine value. In a growth mindset, success is found in the journey. I learn, I grow, I improve, and I find value in that achievement, even if the perceived value of the end product of my work is less than the perceived value of the end product of another individual’s work. For a growth mindset, the journey can be more important than the destination. How should the concept of mindset apply within our classrooms? Whether face-to-face, blended, or online, students need to understand and embrace the concept of a growth mindset. Learning is about the journey. If the focus is on the destination, learning can become a difficult, frustrating, and sometimes defeating experience. As educators, helping students love to learn and helping students learn how to learn well is just as important, if not more important, than the content we teach. Students need to learn to become lifelong learners. They need to learn they can continue to grow throughout their lives. They need to learn they are capable of learning new things, growing to meet new challenges, and are equipped with the skills they need to succeed in life. The challenge to us is to embrace a growth mindset of our own, and then infect our students with it. If we can meet this challenge, we set up each student with the ability to meet their full potential, which should be the goal of every educator for each of their students. I recently had a chance to attend the iNACOL Blended and Online Learning Symposium. This event is an annual gathering of educators from around the world working in the field of online learning. “Online learning” includes those working in blended learning environments, fully online environments, and everything in between. It’s impressive to see the size of this conference each year. It is inspiring to see the number of committed, innovative educators working each day to provide high quality learning experiences that our students deserve. There is innovation happening all over the globe at the classroom level, school level, district level, and even state level. I’m proud of Idaho Digital Learning’s leadership in the field of online learning. Idaho Digital Learning has provided capacity as Idaho’s state virtual school since 2002. During that time, our small virtual school has grown and has continued to provide greater choice, flexibility, and services for Idaho public schools. Idaho Digital Learning has continued to stay on the leading edge of technology and learning. Dr. Sherawn Reberry, Director of Education Programs, and Niki Walker, Professional Development Manager, co-presented a blended learning session at this year’s iNACOL event with blended learning educators from two other states. Over 200 participants turned out for the session! This is a great complement to the quality provided by Idaho Digital Learning’s Professional Development Team through our Blended Learning Program. It has been an honor to serve the state and grow along with this organization for the past 13 years. I am excited to see the growth of online learning and other innovative educational opportunities for students around our great state. We look forward to continuing to partner with our public schools to provide Idaho students with a first class, 21st Century education.